The Surround Sound Music System has built in Bluetooth receiver,integrated Audio Amplifier, Subwoofer Speaker with 8" subwoofer. The home theater electronics include 3.5 mm headphone output or RCA audio output. The home theater gear built in Bluetooth receiver. Multi-function Remote Control and Full Instructions are included. This product inherits the simple and practical design concept and continues the fine workmanship. It features a black-tone design that blends in with a variety of stylish consoles. The main cabinet is made of wood. The black cover on the front panel is dust-proof. It is convenient to use as a TV stereo, which is convenient and practical. Its scope of application is not limited to households, KTV, shops, classrooms and other common occasions, it is also suitable for outdoor use. 1. This Surround Sound Music System offers an impressive price/performance ratio and a careful and safe design. The optimized circuit allows it to operate stably for a long time; it uses environmentally friendly materials and is safe and non-toxic to use. 2. It uses the DSP architecture to fully digital electronic crossover, and innovatively brings the new enthusiast-class speaker unit to the extreme. 3. This product design style is simple and generous. The wooden trapezoidal box can reduce standing wave interference and make the sound more pure. 4. 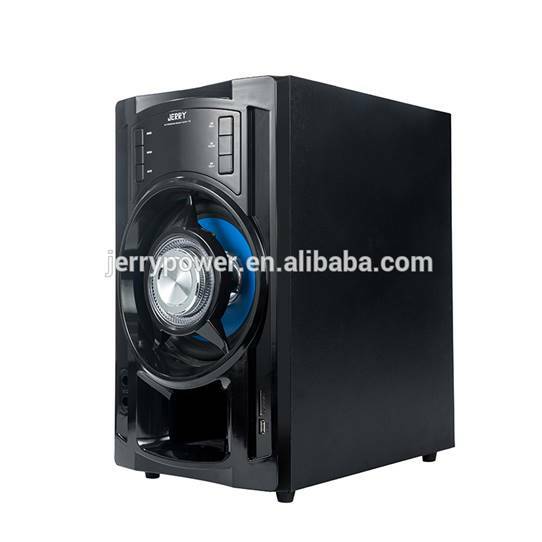 This speaker not only has the AUX audio input function of the traditional home subwoofer, but also adds functions such as SD, FM radio and Bluetooth, and all support remote control operation.